Despite the bright prospects for India's economic growth, inflation continues to play spoilsport in our lives. As a result, we have recently been witnessing a relatively rapid rise in the cost of living times. Of course, inflation is beyond our control. Only a smart investment can ensure our financial freedom, providing us with sufficient funds to fulfill our dreams and financial goals. Unless we invest astutely and earn profitable returns, the ever rising living costs will pinch us hard with the passage of time. No wonder, then, that a strong investment portfolio would be intelligently eclectic, comprising of stocks, bonds, gold etc. Sadly, however, one investment class - Real Estate - often gets overlooked by some of us. This is because people think that real estate investment is too pricey and that it is meant only for the super rich class. Even some of the most savvy investors shy away from investing in real estate, terming it as risky and hassle-prone! 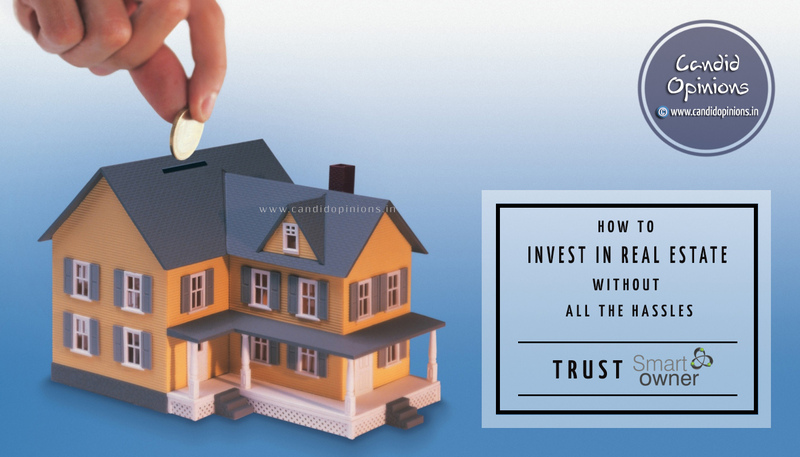 On the contrary, given the prospect of a regular cash flow, the tax benefits that it offers and profitability from capital appreciation of the property, I believe that every investor should earnestly consider adding real estate investment to his or her portfolio. My good friend Puneet had bought a relatively small piece of land at Avantika for merely Rs 8 lakhs in 2001 when infrastructural development in the locality was still in a nascent stage. He built a two storeyed residential building in the plot and put it on rent. A couple of years back, he sold off his property for close to Rs 90 lakhs, making a humongous profit. Thus if chosen wisely and with due diligence, a real estate property could be an ideal investment choice because a prime property never loses demand or value. Not only is it a great option to generate regular passive income (one of its biggest benefits being that it could provide a steady income stream significantly higher than what other traditional investment options yield) but one can also benefit from the capital appreciation of the property in the future. Yes, there are times when buying real estate may not be the wisest decision. But I believe that 2018 is an opportune time to make the plunge into real estate investment - and there are sound reasons for saying that. Firstly, it's a buyers’ market right now, and will remain so for the next few quarters. Secondly, the home loan interest rates are at all-time low, following a reduction in the interest rates by most of the major banks and housing finance companies. Moreover, the plethora of regulatory reforms undertaken by the government has facilitated a more transparent and robust environment in the realty sector and therefore it's a win-win situation for home buyers and investors. Having said that, although the real estate market offers ample opportunities to an investor for making significant gains, investing in real estate is a lot more complicated than investing in stocks and bonds. The risks involved with investing in real estate scare away many a budding investor. There have been numerous cases of fraudulent sale, where gullible investors were duped by unscrupulous brokers and crooks and lost their invested money, or were left in the lurch by the developers due to inordinate delays in handing over completed projects. Not just that, profitability in property investment isn't as straightforward as one might think. One needs to find the right property to invest in. One would want to pick an area where vacancy rates are low and where the value of the property would significantly appreciate over time. A real estate property can be a great investment and it can also prove to be a very poor investment if not chosen carefully. Moreover, the entire process of sifting through various listings for potential investments, followed by site visits and then trying to get mortgage quotes and so on can be stressful and time consuming. This is where a credible real estate investment management company like SmartOwner (www.smartowner.com) can come to the rescue. Back in 2016, my elder brother Alok, who lives in Bengaluru, had attempted to add a second property to his investment portfolio. He had chosen a really good property but the deal fell through at the last minute. Not to be disheartened, he kept on looking for a better opportunity and that's when he came across SmartOwner who not only helped him get a lucrative prime property to invest in but also guided him at every step. No wonder, Alok vouches for their reliability. It was upon his suggestion that I decided to check them out. I must say, I am thoroughly impressed by how SmartOwner functions and will definitely recommend it to any investor looking for property investment. Why Choose SmartOwner To Invest? Not only is SmartOwner India's largest marketplace for real estate and other high-value asset classes, but they have also taken real estate investment to an altogether different level. By putting together institutional-grade deal structures with major realty developers, SmartOwner enables its clients to get incredible rate of returns without having to deal with the developers. Not just that, SmartOwner also offers exclusive investment opportunities that are not available in the general market. SmartOwner is highly selective about the deals it does, approving investment in only 1% of all the prospective deals. In fact, every deal that is brought before them is made to undergo and pass a 72-point checklist that inspects everything from the title rights to the water table of the property. I have also come to know that they spend up to about 2 crores on due diligence before shortlisting a deal. 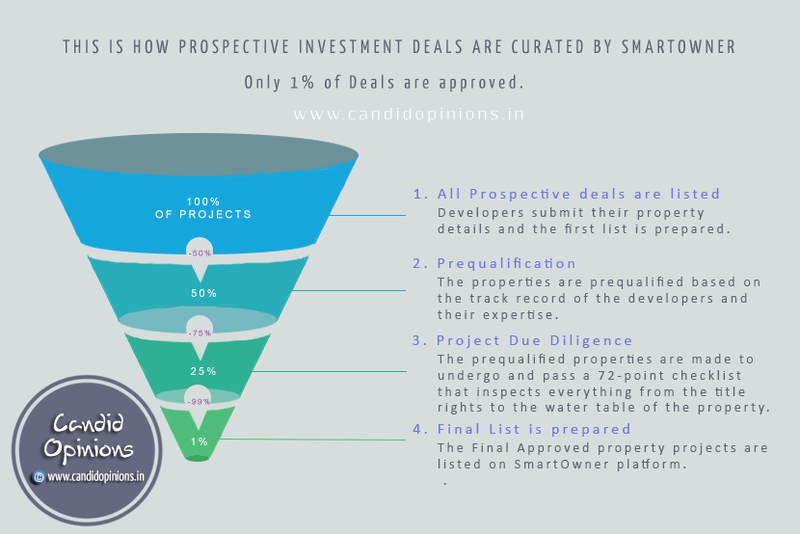 Thus the approved investment deals that one finds on SmartOwner website have been carefully curated after putting every potential investment listing through extensive legal, financial and project-specific due diligence, to make sure that every investment of its clients involves minimum risks and offers maximum returns. What makes SmartOwner different from a P.E. firm is that apart from having the capital deployment ability, SmartOwner also provides its clients with legal, financial and operational expertise at every step of a property investment, which is unprecedented and unmatched. Given their exceptional in-house teams having extensive domain expertise in all aspects of Indian real estate, therefore all legal, financial, and project-specific due diligence aspects of a particular property deal are duly taken care of. Thus a SmartOwner client remains worry-free all through. SmartOwner allows an investor to buy a property with a variable up-front payment. Additionally, the investor gets the option to choose SmartOwner to resell the property for him at a later time which would save him time and effort he would have otherwise spent trying to market it. It would also mean that the eventual buyer of his property will pay the balance amount due on the property. Thus the investor would not have to pay anything beyond his initial payment. Because of its large client base, SmartOwner enables property developers to sell a large amount of their inventory very quickly. The developers, in turn, are therefore willing to offer wholesale prices on SmartOwner.com and thus an investor gets a purchase price that would be almost 30% or more below the current market price. In fact, sometimes the price on SmartOwner.com is as low as the developer's own cost. How To Invest Through SmartOwner? An investor first has to select a property from the several listings on www.smartowner.com (each one of which would have been carefully curated and pre-vetted by SmartOwner's in-house team), available at exclusive rates. He can be amply sure that his investment would remain safe because a project is approved and listed on SmartOwner only after it passes their rigorous standards. After selecting a particular property of his choice, the investor needs to lock in the deal by online payment, wiring the purchase price to SmartOwner's escrow account which is very secure. On SmartOwner.com, an investor can get started with a variable up-front payment, ranging from 10 lakhs to 10 crores. After the purchase price has been wired to SmartOwner's escrow account, the investor can just sit back and enjoy the profits while all the legwork is handled by SmartOwner, right from ensuring that the investor receives a quarterly return to reselling the residential property for him. With so many advantages being offered by SmartOwner, I am not at all surprised by their huge client base. Investors looking for a profitable and hassle-free property investment should therefore check out www.smartowner.com. I am sure, they will be immensely benefited if they invest through it.